« Fig Theft: what took all my figs this year? I am writing from the Cambridge University Institute of Continuing Education about an upcoming weekend course that may be of interest to visitors to this web-site. The weekend course: ‘Bees, Flies and Flowers: the ecology of pollination and why it matters’ 26 – 28 June 2015. Are you worried about the plight of wild bees and other pollinators? These insects provide a crucial service pollinating crops and wildflowers. Yet there is widespread concern about their decline. This course will teach you how to identify and monitor common pollinators such as bumblebees and hoverflies, how to measure their importance to flowers, and how you can contribute to pollinator conservation. You will learn to assess your own garden for its value to pollinators. You will try out practical techniques used in pollination ecology, including preparing a pollen sample for microscopic examination and measuring insect behaviour. Expect to go home with an entirely different view of flowerbeds and road verges. The course is taught by Dr. Lynn Dicks, Research Fellow at the University of Cambridge Department of Zoology. Lynn has a PhD in the ecology of pollinating insects, awarded from Cambridge in 2002 and has continued to work as a science writer and broadcaster for 10 years. She is keen that as many people as possible notice and enjoy the diversity of wild pollinators that busy themselves around us every summer. After a rapid burst of flowering in the plums, the weather cooled (dipping here to -3˚C at grass level on the night of Sunday April 26) and the plums then took time in dropping their petals and had a fairly long interval to 90% petal fall. Most are now over, along with the majority of pears and the earlier-flowering cherries. The first part of this week brought a few challenges for the apples just starting to flower. Strong winds and heavy bursts of rain battered the opening flowers and many varieties showed signs of petal loss and damage. A short, sharp burst of hail stones on Wednesday morning was probably the last straw for many. The crop may still be good if pollination had already taken place but we will have to wait and see for the outcome of this. The orchards are looking much greener now and just a few varieties remain on the NFC recording list. This number will reduce even further in the next few days as the delicate blooms of the quinces drop away for another year. 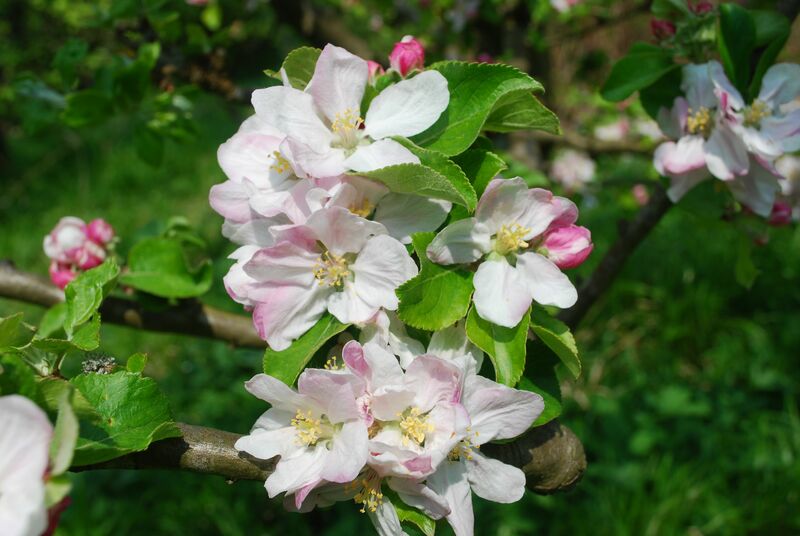 However, blossom-laden trees can still be found in the late-flowering section of the apples and the usual late-comers are yet to be recorded. On Crawley Beauty the first blooms are just opening and on the neighbouring Feuillemorte trees pink buds are beginning to show.